U.S. Federal Route 322 runs east-west across the entire state of Pennsylvania. It goes from the Ohio State Line to the New Jersey State Line. Info on U.S. Rt. 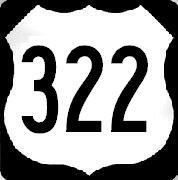 322 is broken down by county below.